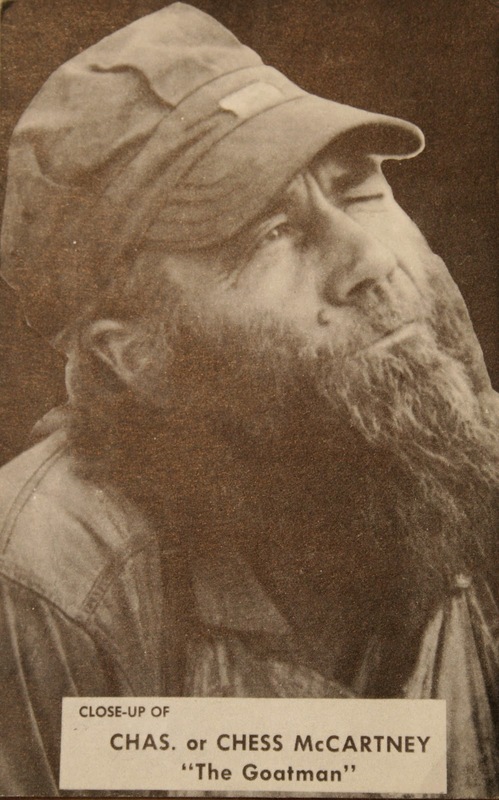 Of all the folk heroes in the history of the American Roadside my absolute favorite has to be the Goatman, Ches McCartney. 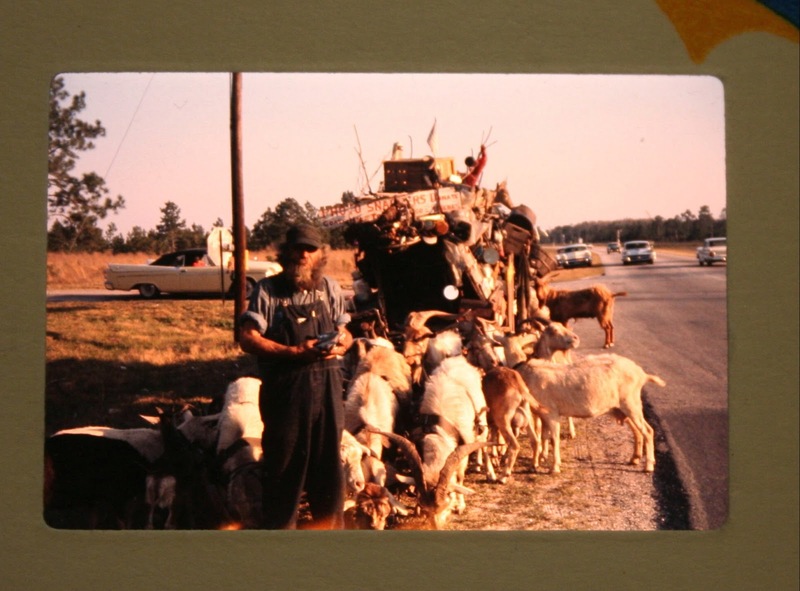 My interest in the Goatman begin one day as I saw THIS photo on my friend Eartha Kitsch's Flickr page. The picture was a photo of an wild looking bearded man and a herd of goats. Eartha did a little research and found that the Goatman was an icon. I had to know more. So who is the Goatman? With the legend of the Goatman it is virtually impossible to sort out fact and fiction. In the end it doesn't matter though, truth and fiction fuse perfectly to form legend. 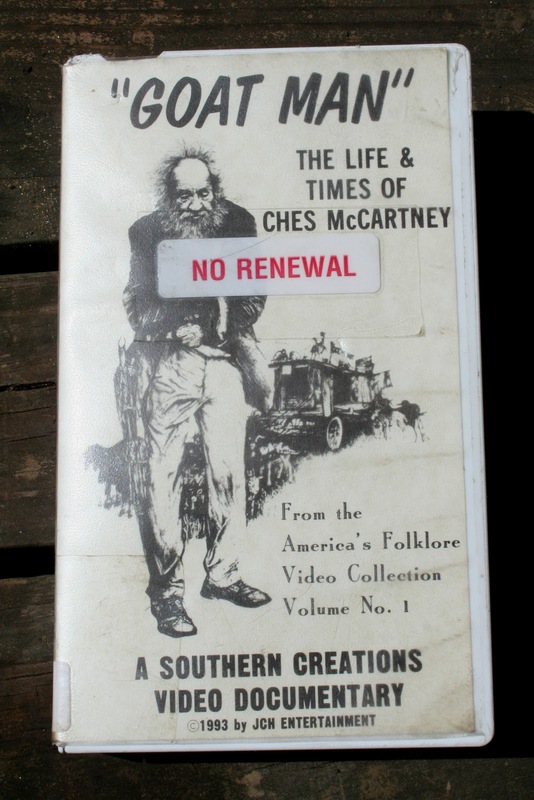 Ches McCartney was originally a farmer from Iowa. He would later leave the family farm and make money wrestling bears for money. He would marry a Spanish knife thrower, where it was his job to both keep her knives sharp and to have knives near-miss him as part of the act. McCartney would later become a lumberjack where a large tree would fall on him and seemingly crush him to death. McCartney would jump back to life as the Undertaker stuck the embalming needle in his arm. Being injured Ches was unable to continue working. Not wanting to become a ward of the state, Ches would set out across America with a herd of Goats. 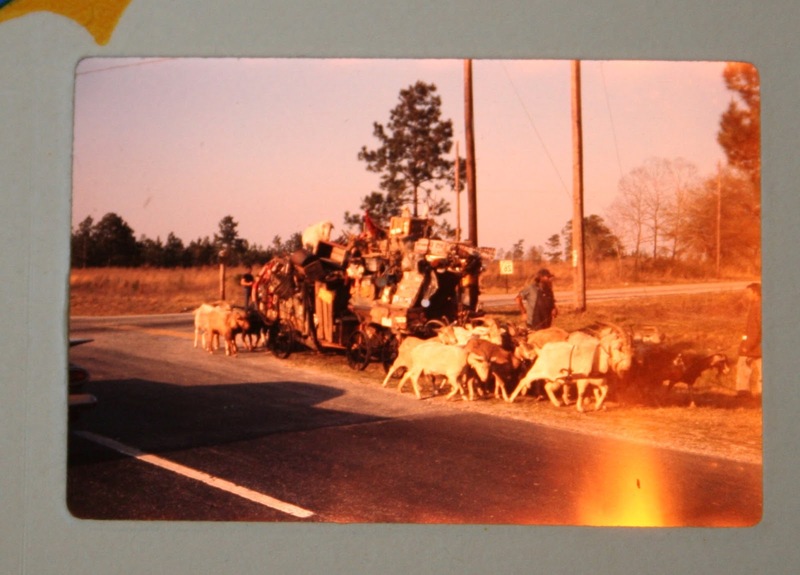 The Goats would pull a giant rig full of junk. The Goatman would live off of goat's milk and donations from strangers. Once he set up camp in a field he would burn rubber tires to attract attention. When people began to gather they would be fascinated by the strange sight of that Goatman and his herd. He would market himself and sell postcards of himself and his rig. He would charge 25 cents for one and three for a dollar. The Goatman would also preach out of the Bible. His sermons were legendary in that they were laden with profanity and curse words. He started up his own "Free Thinking Baptist Church" in Georgia. As the Goatman traveled the two lane roads of the South for the better part of a century he would be a popular distraction for roadside travelers. There are numerous rumors and legends surrounding McCartney. The Goatman supposedly had a two legged Goat that would walk upright on its back legs. Some people claimed that he was actually an eccentric millionaire and would make large withdrawls from banks. Others claim seeing a mysterious woman in a Cadillac dropping off supplies for the Goatman. The Goatman was believed to be married several times and have numerous children. His son Gene would travel with his father. The Goatman claimed to have a son who was a Wall Street Broker and another who had died in Vietnam. The one unanimous recollection of the Goatman was his smell. Supposely he was the most horrible smelling human being that people had ever encountered. But what do you expect from someone who lives with a bunch of goats? 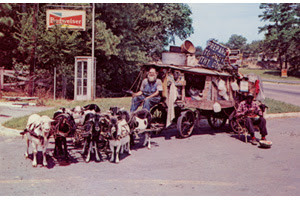 National progress would take its toll on the Goatman as the old two lane roads were replaced with high speed freeways. The Goatman could no longer safely travel on the main roads and was forced to ditch his goats. The Goatman's wanderlust could not be satiated as began to travel as a more traditional "hobo". The end of his travels would come in the early 80s when he hitchhiked to California in an attempt to marry Morgan Fairchild. On the way the Goatman was violently mugged effectively ended his travels. The Goatman retired in a nursing home in Macon Georgia. He would die shortly after his son Gene (now living in a school bus) was brutally murdered in an unsolved crime. 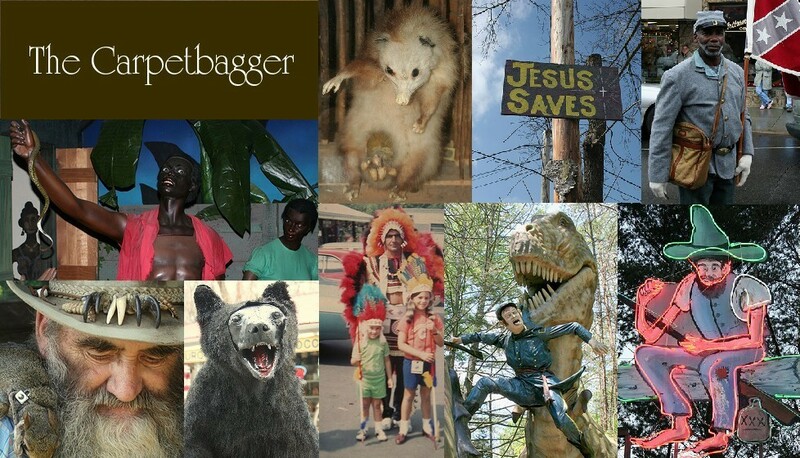 I desperately wanted a my own piece of Goatman history, so I set out to find one of the postcards he sold. My mother would find one for me for Christmas. Ches would watch over me, pinned to the wall in my office at work. I would wind up with an even bigger prize. That very same Christmas my mother bought me a huge box of vintage 35 mm slides. Collecting such slides is one of my hobbies. As I went through these hundreds of slides one-by-one, I almost had a heart attack when I found this. I was now the proud owner of a one of kind original photo slide of the Goatman, Ches McCartney. I immediately called my mother, she had absolutely no idea that there were photos of the Goatman in the box of slides she had purchased. It was a remarkable coincidence. There was also another shot of the Goatman's Rig. I also found a great VHS documentary on the Goatman at the local library. Its a great little documentary, but the editing is really strange. For some reason they leave in multiple takes as the documentarian misspeaks and then starts saying the same thing over again. There is also a great song by folk singer Chuck Brodsky about the Goatman on his "Color Came One Day" CD.